In this beautifully rendered modern classic, Sharon Kay Penman redeems Richard III—vilified as the bitter, twisted, scheming hunchback who murdered his nephews, the princes in the Tower—from his maligned place in history with a dazzling combination of research and storytelling. Born into the treacherous courts of fifteenth-century England, in the midst of what history has called The War of the Roses, Richard was raised in the shadow of his charismatic brother, King Edward IV. Loyal to his friends and passionately in love with the one woman who was denied him, Richard emerges as a gifted man far more sinned against than sinning. This magnificent retelling of his life is filled with all of the sights and sounds of battle, the customs and lore of the fifteenth century, the rigors of court politics, and the passions and prejudices of royalty. I’ve either mentioned this book or the Author several times during the life of my reviews so I have decided it was about time I actually wrote a review on the book itself. This was the debut novel for this Author. I was first introduced to both the book and the Author by my History Professor whilst taking my Masters in History many years ago. She recommended it to me on the basis of it being the most accurate account of the times she had read in fiction form. Being a Yorkshire woman by birth and therefore, a staunch Yorkist, I was slightly apprehensive when I picked this up as most accounts of Richard III and the House of York are based on Tudor propaganda from the times, and are slewed very much in their favour. I found none of this when I read this long 936 page book. 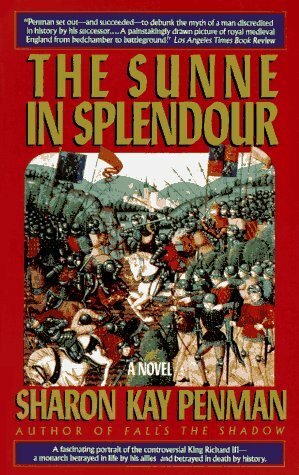 The book itself could be broken down into thirds; the first brings into the light that confusing history of the Wars of the Roses, and for readers who are not up to speed with the ins and outs of this time it is a great way not only to get to know the key players, but where they fit together in the whole sorry mess. Yes it does sound a little like a history lesson, but it is given in such a manner that it skilfully and neatly pulls the reader so far into the novel that they have no choice but to read to the end. Just by reading the first part of the novel it can be clearly seen that this Author has done extensive research into the period, and this comes through in way in which locations are described and characters react to their environment. The remaining two-thirds catalogue the reign of Edward IV and also the life of Richard. Character development is stunningly done within the pages of this book. The reader is not thrown huge chunks of back-story and motivational traits, but slowly includes them as the plot progresses. Their fears are revealed, sometimes surprising the reader, and the political machinations that ruled their everyday lives are uncovered slowly, rather like peeling the layers from an onion. Obviously the main focus of the book is Richard, and it follows him from a very young age when he is very much in the shadow of his brothers through to his death on the battlefield. The Author does not portray him the same light as Shakespeare, but rather gives him a more human face than the one constantly given to him of that of monster. A compelling and believable case is presented regarding his nephews in the Tower of London, which rather makes the reader consider that this could be a case of the wrong people mishearing words said at the wrong time and in frustration, as in the case of Thomas Becket when King Henry II uttered ‘who will rid me of this meddlesome priest’; we will never know. I could write for hours on this book, but to do so would have me revealing spoilers and getting into the whole White Rose versus red rose debate (yes the capitalization error was deliberate *smile), so I’m going to leave this review short, and I hope tantalising enough to make someone want to actually pick this up and read it. I would highly recommend this novel to anyone looking for a good read. I have read it several times and yes, my History Professor was right it is the most accurate account of the times in fiction form. This entry was posted in No Spoiler Reviews and tagged 5 Thumbs, Catholic Church, Death, Drama, England, Historical, Military, Murder, Mystery, Political, postaday. Bookmark the permalink. I’m with you on this, Cate. One of my favourite books, by one of my all-time favourite writers. Very few writers of fiction set in this era can compete with Sharon Penman. I guess this was a biased review on my part seeing as I own ALL the books she’s ever written. Ah well, I hope no one will deny me just the one biased post.